"Miami Central Station" redirects here. For the transport hub near Miami International Airport, see Miami Intermodal Center. Skidmore, Owings & Merrill and Zyscovich Architects (2017) and Engineering: TLC Engineering for Architecture, Inc.
Virgin MiamiCentral, formerly MiamiCentral, is a mixed-use railroad station development in the Government Center district of Downtown, Miami, Florida. Right now, the station serves Virgin Trains USA higher-speed rail (formerly known as Brightline) and connects to the adjacent Government Center station serving Metrorail, Metromover, and bus lines. In the next few years, the station will serve Tri-Rail commuter rail. The 9-acre complex also includes 3 million square feet of residential, office, commercial, and retail development. The station was built by All Aboard Florida, a subsidiary of Florida East Coast Industries (FECI) overseeing Virgin Trains USA. Virgin MiamiCentral was designed by Skidmore, Owings & Merrill in association with Zyscovich Architects. Its name was changed from MiamiCentral to Virgin MiamiCentral on April 4, 2019. MiamiCentral was originally a railroad station opened April 15, 1896 as the southern terminus of Henry Flagler's Florida East Coast Railway (FEC). The station was the southern end of the FEC line until 1905, when construction began to Key West via the Overseas Railroad. The FEC built a wooden passenger station building in 1912 at site of what would become the Dade County Courthouse. Construction on the courthouse was started in 1925 and finished 1928. Seaboard Air Line Railroad intercity passenger rail started service at the location in 1927. FEC and Seaboard both regularly serviced the site until January 23, 1963, when union workers for both companies went on strike. At the insistence of the City of Miami, which had long fought to get rid of the tracks in the downtown section just north of the county courthouse, the downtown passenger terminal was demolished by November 1963. Although a new station was planned at the Buena Vista yard near North Miami Avenue and 36th Street (US 27), it was never built. The site of the old station was left as parking lots until construction of MiamiCentral began in 2014. When FEC ended their passenger service, this left Seaboard Coast Line Railroad (service absorbed by Amtrak in 1971) as the sole intercity rail in Miami. They operated out of the decaying Allapattah terminal at Northwest 22nd Street and Seventh Avenue (US 441) until in 1978 Amtrak moved to its current location near Hialeah. In March 2012, All Aboard Florida, a subsidiary of Florida East Coast Industries that also owns the Florida East Coast Railway, announced plans to connect Miami and Orlando with Higher-speed passenger rail service. In May 2014, All Aboard Florida unveiled their plans for the 9 acre site, with construction anticipated to begin in late 2014. The company planned to build two tracks on either side of an island platform 50 feet (15 m) above street level and 3 million square feet of transit-oriented development, with retail shops at street level and hotel rooms, housing and office space occupying towers above the station. In August 2014, preparatory work began with the removal of parking lots that had previously been located on the site. Construction of the facility began in mid 2015, when subterranean support pilings began to be built, and by the end of the year foundation and frame construction was underway. By October 2016, construction of the rail facility was about 70% complete, while work on the lower structure of the office and residential buildings had begun. When Virgin Trains USA (then Brightline) began revenue operations in January 2018 between West Palm Beach and Fort Lauderdale, MiamiCentral was still incomplete. Service to Miami was planned to begin at the end of April 2018. Brightline service to MiamiCentral commenced on May 19, 2018. In its final design, MiamiCentral includes a 50,000 square foot dining and grocery marketplace dubbed Central Fare, 130,000 square feet of retail space, one residential building with 800 apartments, and two office buildings. It will have five tracks, with three serving Virgin trains and two serving Tri-Rail trains. The office buildings are 3 MiamiCentral (12 stories, 96,000 sq. ft) and 2 MiamiCentral (190,000 sq ft.) MiamiCentral is directly connected via a pedestrian bridge over NW 3rd Street to Government Center station, which is served by Metrorail rapid transit trains and Metromover automated people mover trains. The Tri-Rail commuter service is investing 70 million at the station in the "Tri-Rail Downtown Miami Link" project. The opening has been moved to 2019 which comes from Tri-Rail to use rails from the FEC corridor in the section up to station. Regulations require a working PTC systems for that while Florida East Coast Industries has not submitted the necessary application yet. [needs update?] As the Florida Railroad Administration has up to 180 days for a first response, officials do not expect test runs of Tri-Rail into the new station before the end of 2018. On the other hand, Virgin trains can reach their single platform without an approved track field. Tracks 4 and 5, along with Platforms D and E, will open in 2019 in conjunction with Tri-Rail's Downtown Miami Link service. ^ a b c Vassolo, Martin. "Brightline has finally announced a start date for service for Miami commuters". Miami Herald. Retrieved May 12, 2018. ^ Elfrink, Tim (January 4, 2016). "Here's What Giant MiamiCentral Train Station Might Look Like Inside". Retrieved April 27, 2018. ^ "Florida Rail Developer Selects SOM for Station Plan". SOM. July 30, 2012. Retrieved February 11, 2015. ^ "Miami, FL (MIA)". Retrieved April 27, 2018. ^ a b Einstein, Paul (September 23, 1963). "It's Coming Down This Week!". The Miami News. p. 2A. Retrieved March 29, 2011. ^ Howe, Ward Allan (November 3, 1963). "THE FLORIDA RUN: Railroads Anticipating a Busy Winter—New Schedule Effective Dec. 13" (PDF). New York Times. p. XX13. Retrieved March 29, 2011. ^ Kleinberg, Howard (April 24, 1986). "Seaboard Ended Rail Monopoly". The Miami News. Retrieved April 24, 2011. ^ "Florida East Coast Industries, Inc. Announces Plans for Private Passenger Rail Service in Florida | Business Wire". www.businesswire.com. Retrieved May 6, 2016. 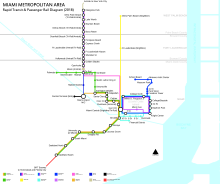 ^ "All Aboard Florida: Plans for downtown Miami station unveiled". Retrieved April 27, 2018. ^ Vazquez, Christina. "All Aboard Florida unveils designs for Miami station". www.local10.com. Retrieved April 27, 2018. ^ "Work begins — finally — on Miami-to-Orlando fast train". miamiherald. August 25, 2014. Retrieved May 6, 2016. ^ a b "Huge Miami train station about to rise from ground". Sun Sentinel. November 27, 2015. Retrieved January 29, 2018. ^ a b "Here's a look at progress on MiamiCentral train station as construction chugs along". Miami Herald. October 21, 2016. Retrieved January 29, 2018. ^ "Brightline starts service Saturday; round-trip fares starting at $20". Palm Beach Post. January 11, 2018. Retrieved January 29, 2018. ^ "Brightline president: 'Train ridership is three times what we expected'". South Florida Business Journal. March 7, 2018. ^ "Chew Chew! Miami-centric restaurants opening in downtown rail depot". Miami Herald. May 6, 2016. Retrieved January 29, 2018. ^ Bandell, Brian (February 19, 2018). "First building at Brightline's Miami station completed". www.bizjournals.com. South Florida Business Journal. Retrieved February 24, 2018. ^ "Connection Made: Pedestrian Bridge Installed Between MiamiCentral, Government Center Station". The Next Miami. October 8, 2018. Archived from the original on November 13, 2018. Retrieved November 13, 2018. ^ "Tri-Rail Downtown Miami Link". Retrieved 2018-01-17. The key to this leveraging is a local investment of $70 million by the public for incremental construction costs by the public partners for the MiamiCentral Station, to accommodate Tri-Rail trains and new rail infrastructure to support the extension into Downtown Miami. ^ Katya Maruri (2018-04-17). "Tri-Rail won't roll into downtown Miami this year". Miami Today. This page was last edited on 17 April 2019, at 05:08 (UTC).